Aircraft Ground Handling System Market size valued at over USD 130 billion in 2018 and is estimated to exhibit more than 5% CAGR from 2019 to 2025. Factors such as to avoid delays caused by aircraft, baggage safety & security along with reduced ground time for ensuring operational efficiency are driving aircraft ground handling system market. Rising air traffic across the globe has led to increase in flight iterations which has resulted in demand for efficient and effective customer services. As per analysis, global aviation industry is valued more than USD 35 billion in profits in 2018, up from USD 8.5 billion in 2011. Between 2017 and 2036, the number of airline passengers is expected to grow at 5%. Considering present trends, passenger numbers could double to 8.2 billion in 2036. Such an increase in air traffic is anticipated to demand for improved capacity of ground handling staff and services, thereby enhancing the forecasts of GSE suppliers and vendors. Airports are undergoing continuous upgradation to enhance infrastructure and improve customer experience. Low commodity price, stable GDP growth and strong passenger demand are the other significant factors stimulating industry growth. In addition, improvement in airport infrastructure, growth in aviation sector and shifting trends for replacement of conventional systems in the aircraft with advanced efficient system is propelling product demand. Also, rising per capita disposable income mostly in emerging nations in conjunction with reducing air fares is positively influencing the aircraft ground handling system market penetration over the study timeframe. Additionally, the airport operators are adopting innovative technologies and advancement to ensure minimum error and maximum profits. For instance, in October 2016, according to CAPA, the Airports Corporation of Vietnam (ACV) has allocated over USD 16 billion to improve passenger terminal capacity and parking spaces for attracting tourists across the globe. This has further resulted supply chain participants to focus on improve ramp safety to boost the aircraft industry growth. Airport operators are conducting multiple programs for staff training with advanced instruments and systems. For instance, in May 2017, the International Air Transport Association (IATA) introduced RampVR, a first virtual reality training platform for aircraft ground handling operations in Bangkok, providing a positive outlook for the aircraft ground handling system market proliferation. Challenges such as changing consumer behaviour, increasing demand for quality services along with initial setup cost may hamper industry growth. The demand for a sturdy infrastructure owing to the rising flight travel is the key challenge faced by airliners. 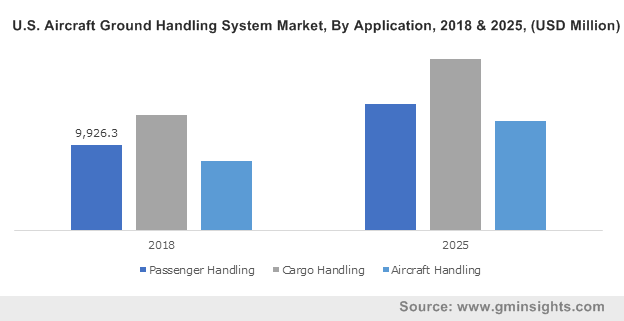 Huge investment for heavy cargo and airplane handling system could further act as a restraint to the aircraft ground handling system market growth. An average handling equipment has a product lifespan of around six-nine years and requires replacement after a time period. Absence of sensors in handling systems will lead to collision with aircraft resulting in significant losses. The implementation of sensors including aircraft proximity detectors ensures effective operations and avoids collisions, will support the market growth. Cargo handling accounted for around 40% aircraft ground handling system market size in year 2018 owing to the increasing air freight demand across the globe. For instance, in 2017, according to International Air Transport Association (IATA), the global air freight demand measured in FTKs (freight tonne kilometres) grew over 9% as compared to over 3.5% in year 2016. Moreover, as per the Airport Council International, in 2017, the air cargo volumes at global 20 busiest airports grew by over 6% as compared to year 2016. The combined cargo volume handled by these airports was around 50 million metric tons and represented the global air cargo volume over 41%. Increasing passenger and freight traffic are expected to drive the commercial aviation segment demand. Also, increasing geopolitical instability will drive the requirements for expansion of national security aircraft fleets, inadvertently driving the aircraft ground handling system market. This has led to significant increase in the overall aircraft production backlogs for major manufacturing companies. For instance, in 2018, according to airbus, the commercial aircraft backlog reached over 7,577 units as compared to around 7,265 units for year 2017. 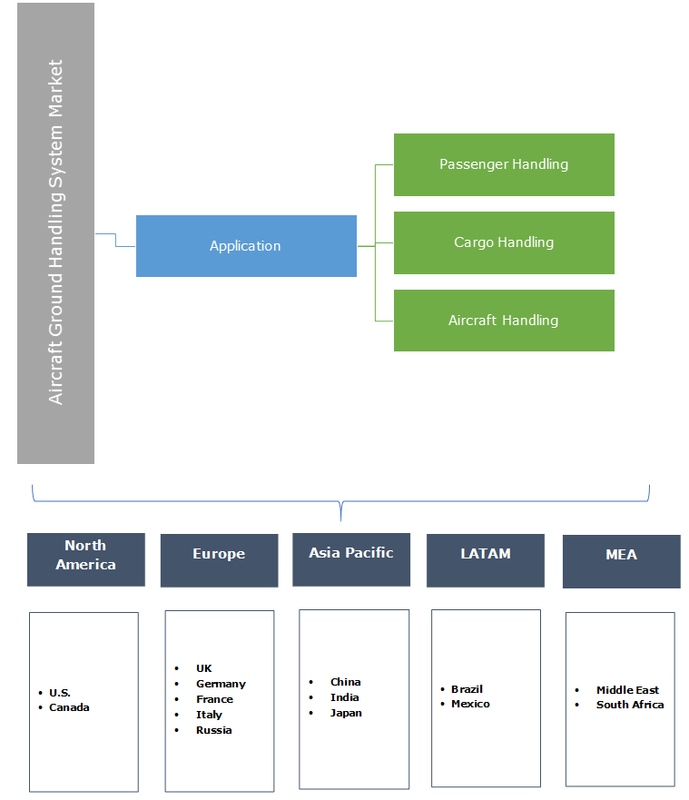 North America dominates the aircraft ground handling system market owing to the presence of many equipment manufacturers and service providers. Rising focus on operational efficiency and satisfying the ever-growing demand of air passengers will fuel the business growth. Busiest airports in the region includes Atlanta International Airport and Los Angeles International Airport, these are also among the top five busiest airports across the globe. Industrial participants are engaged in strategic investments for expanding their service operations for gaining competitive edge. For instance, in November 2018, dnata announced the expansion of services at Los Angeles International airport by providing high quality and reliable ground handling and cargo services. Europe aircraft ground handling system market led by Germany, France, the UK, and Russia will witness a significant growth during the forecast timeframe. Buoyant economic conditions coupled with reduced flight fares are the key drivers in the region. Technological advancements in the industry with the implementation of sensors, tow-less tractors, and baggage management systems to ensure operational safety will further boost the industry growth. In addition, airport privatization with increasing investments from the private sector will support the business growth. Asia Pacific is projected to hold over 25% revenue share by 2025 owing to an increase in travel route options and regional economic expansion. New developments such as liberalization in multiple nations including India and China are continuously improving the global airport ground handling activities. Large population existing in the region is significantly contributing to the regional revenue generation owing to enhanced tourism activities. Increasing number of air commuters in countries such as Mexico and Brazil are driving the Latin America aircraft ground handling system market size. The region has hosted major sports events including the FIFA World Cup and Olympics, resulting in a significant aviation industry growth. The Middle East & Africa will register a steady growth over the study period owing to the regulations associated with an efficient and secure equipment. Aircraft ground handling system market is characterized as highly fragmented industry owing to the presence of multiple global as well as regional players. Swissport, SATS, John Menzies, Bhadra, Celebi, Air+Mak, and Dnata are among the prominent players. Other notable players in the industry include CargoTec, Cavotec SA, PrimeFlight, RampSnake and JBT AeroTech. Previously, airline service providers operated the ground handling services. Liberalization has opened new opportunities and facilitated greater market access for the outsourcing vendors specializing in various areas. As of 2017, over 50% of the services are being provided by the third-party providers. In the U.S., about 65% of the industry is serviced by main airlines’ own handling companies. Each airport and country have different rules and processes for entering the industry. This provides cost-effective alternatives to small service providers to enter the industry. Stringent government regulations including FAA advisory circular, IATA standards and EASA directives are supporting the aircraft ground handling system market growth. For instance, International Air Transport Association (IATA) provides standards to improve safety and operational efficiency in ground handling operations including implementation of processes and training for reduced injuries, ground damage and operational incidents. Moreover, IATA also organizes ISAGO (IATA Safety Audit for Ground Operations) program to ensure increased cost saving by reduction of ground accidents, standardization in ground operations and global recognition and acceptance.